I grew up in a family with eight kids, and we never had money for extravagant gifts. For Christmas, we drew names and one person would buy one other person a gift. That was it (well, except for the occasional gag gift like the time my sisters got me a size D bra when I needed trainers. It just happened to be the Christmas we had a couple hunky cousins visiting from Germany… groan). Anyway, I was getting to the point that we often made our gifts, which turned gift giving into an exciting time especially for the one making the gift. There were some unfortunate gifts along the way—such as the tomato red jersey blazer I made for Mom in junior high. But now that we have the Internet, there are plenty of really great ideas and detailed instructions for handmade or homemade gifts for any occasion and any budget. A lot of these ideas are to die for, so don’t go thinking a do-it-yourself gift is bound to disappoint. Here are ten picks mostly from this website. For each of the gifts shown, you can find a link to a step-by-step tutorial that will help you make your own gift. Upcycle an old pair of shoes as a gift for that crazy sister or imaginative child. I’ve used Porcelaine paints (either the pens or the brush-on type) with great success on scuffed or suede leather clogs. The paint dries shiny like patent leather and does not chip off with time (it will scuff off at the toes eventually, but that can always be touched up). I don’t think you need a tutorial for this, but you can look at my examples in Renew Old Leather Shoes. A hardcover book could be gifted as a journal, a drawing book, a recipe book, or whatever. Be creative with the cover. My sister made this angel chicken with an extra set of wings for the cover of mine (chicken angels do have extra wings, right?). Here’s the step-by-step tutorial for making this handmade hardcover book. This felt hat is my new favorite gift to DIY now. You can read the tutorial for a basic hat in How to Make a Felt Hat, but you should definitely experiment with different brims, decorations, etc. The hat I’m working on right now has a set of magnets that hold whatever you want in place (one magnet is glued to the inside of the brim, and the other is loose so you can use it to attach things to the brim. So fun!). I was thinking of business owners when I came up with this wine cozy. It’s traditional in many companies to give expensive wine baskets to clients at Christmas time. But budgets are stretched these days. With a pretty wine cozy, you can spend a little extra on a single bottle of fine wine and save on the rest of the basket (by not buying it). Here’s the tutorial for making wine cozies. The bling around the neck is the fun part! 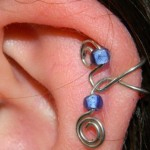 I finally found a use for all my leftover earrings (the one that didn’t get lost). 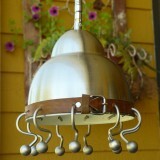 Here is just one example of an upcycled light fixture you can make yourself and give as a gift. The tutorial for this one is in Upcycle a Pendant Lighting Fixture. Click here to see several other examples of DIY upcycled table lamps and pendant lights. Think… a mix of feathers and leather; metal and lace; glass and paint. This is where you not only give a functional gift, but a piece of art as well. I found all the parts to the lamps I upcycled at thrift stores, so my cost was quite reasonable. It’s just a matter of walking all the aisles and grabbing whatever jumps out at you as a potential part of a lamp. Go have some fun! This beaded cuff bracelet was made out of a piece of PVC pipe painted with Porcelaine silver and embroidered with inexpensive glass beads. 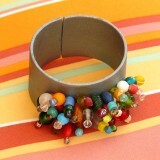 You can watch the video in my post Upcycled Beaded Cuff Bracelet. I used the same concept of the PVC cuff for the bling on the wine cozy above. Just paint and glue leftover earrings, buttons, brooches, leather, or whatever to the top side of the cuff (ooh, a cuff bracelet with multi-colored buttons!) and you’ve got one more gift. No, I’m not suggesting you buy a car as a gift. I am suggesting you write a coupon for an oil change that you will do yourself. This is a huge gift! If you buy the oil at Sam’s Club or some other discount store, it’s an affordable gift on your side, and it saves your loved one a ton of money and hassle. It could be the most asked-for DIY gift in years to come! 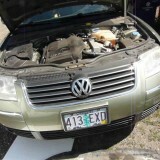 This video will show you how to change the oil and oil filter in a Passat. Since I only had nine gift ideas on my site, my friend Savvy Practicality was kind enough to let me add her easy cuff earrings to the list. These quirky departures from the standard lobe earring are so dainty and pretty that you will want to find girls that aren’t even on your gift list to make them for. These molten silver earrings may be out of your price range and a little challenging to make, but check out my video where I show how and with what they are made (Faux Melted Silver Ore Earrings). I’m joking, of course. 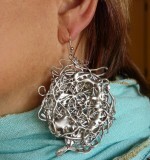 These elegant earrings are extremely affordable and easy to make. You’ll be making brooches and wine cozy bling with this method too, I bet. P.S. These earrings weigh almost nothing. Some people on your gift list celebrate Hanukkah instead of Christmas. Here is one gift that can be given to either set of friends. See the easy step-by-step instructions for making a menorah out of a birch branch. Thanks for the ideas. I’m now thinking of making this kind of personalized gift for my friends. I know this will take time but the thought of doing it by myself is fantastic and fulfilling as well.